It’s an overview of the topic covered by the lesson, a general presentation that makes clear to the student the lesson’s purpose. It includes a mention to any possible grammatical peculiarity or complexity of that topic. Every lesson includes a narrative text covering the vocabulary and grammatical issue of that same lesson and is adapted to the learning level. Each text is part of a whole story about an American family (parents, two sons and a daughter) that is relocated in Italy: their experiences are told from the first approach (looking for a house) to their everyday routine (work, school, problems, activities…), which perfectly represents all the possible needs of a stranger coming to Italy, helping him/her with practical issues and useful lexicon. What – Elements of grammatical analysis, explanation of the subject from a grammatical point of view. When – List of the different cases of use of that topic, details about the contexts, inclusion in example sentences. How - Formation of the grammatical elements of the language and exceptions (if there are any): plural of nouns, conjugation of verbs, pronouns construction etc. Affirmative, interrogative, negative form – Every grammatical element (not only verbs) is inserted in a sentence in the three forms: affirmative, interrogative and negative. This helps students to practice on every possible application of that sentence and to work repeatedly on the sentence construction. Practical use – This is the most helpful part for students to observe the “real Italian”, i.e. how the topic of the lesson is used in real possible contexts. These are mostly dialogues concerning the everyday life of the Italo-American family of the stories, which are perfectly real experiences and include everything that could be useful for a newcomer in Italy. Games represent an educational tool that provide opportunities for deeper learning. To progress in a game is to learn: “learning” doesn’t mean rote memorization, it means acquiring the skills and thought processes needed to respond appropriately under pressure, in a variety of situations: games provide effective, interactive experiences that motivate and actively engage in the learning process and they allow not only to gather knowledge but also to learn how to make choices. Flashcards bear information, as vocabulary, numbers, verbs, expressions. They are widely used as a learning tool to aid memorization, by soliciting the mental process of active recall: given a prompt (the question), one produces the answer (physical flashcards have two sides with answers overleaf). Once the answer is inserted in the box, it can be checked with the “Show answer” button. The classical paper and pencil guessing game is known in every country and allows a rapid stimulating learning. 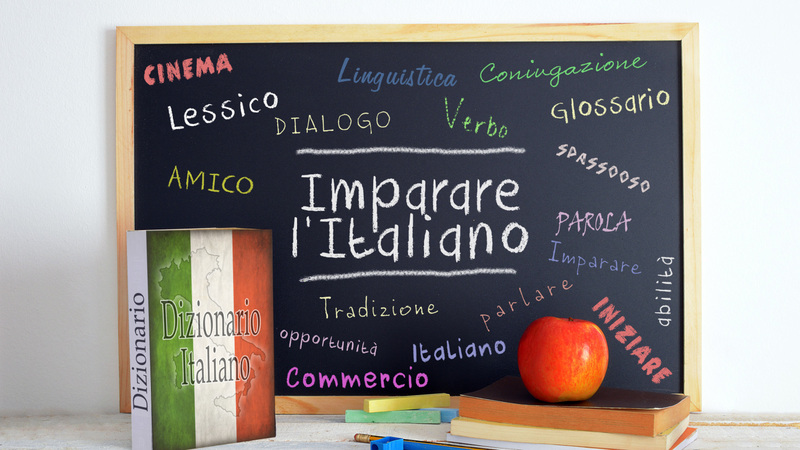 A word, phrase or sentence is provided in English and the student tries to translate it correctly in Italian by suggesting letters or numbers (clicking on them), within a certain number of guesses (10). The student has to complete each box with the correct translation of the given noun/verb (across and down). By clicking on the “Show answers” button, the puzzle will complete and the student will check his answers in the boxes. Through the “Restart” button e new word puzzle will appear, so to practice more times. The exercises in this section are structured to use the vocabulary and grammatical issue(s) treated in the lesson. They provide a more specific use of the vocabulary and grammatical topic because they are applied in a context, that is included in sentences, dialogues or real life situations. It consists of a phrase, sentence, or paragraph with a blank space indicating where the student should provide the missing word or words. The “Submit answers” button allows an immediate check through green (for correct answers) and red color (for wrong answers). Through the “Restart” button e new exercise will appear. After reading a real life dialogue concerning the life of the Smith family (STORIA in lesson), a true or false quiz has to be solved. The “Submit answers” button provides the percentage of correct answers and marks the wrong ones. After reading a text, including the grammatical topic of the lesson, a true or false quiz has to be solved. After a 2-minutes listening (which is also downloadable), a true or false quiz has to be solved. A set of three sentences is provided, one of which is correct. The student has to click the right answer and can check his result through the “Submit answers” button which provides not only the percentage of correct answers but also, in case of error, marks which one would have been correct. The “Chat” button activates the English translation, which is marked in green, for every text (except Games and Proficiency). The X button allows to go back to the list of chapters, which are divided in 3 sections: Beginner, Intermediate, Advanced. It contains all the vocabulary used in the lesson: every word (nouns, adjectives, verbs…) can be listened to, and translated thanks to the “Chat” button. This section is for students to write down notes, reminders, questions, doubts… which the teacher may see and possibly answer. The LanguageTribe platform contains more than 35.000 words which are searchable through this box. It gives the opportunity to schedule a tutor lesson, choosing by day (clicking on a calendar) or by teacher (choosing from a list of available teachers). A video session will start on the chosen day and time to allow the student(s) to have a private learning session.